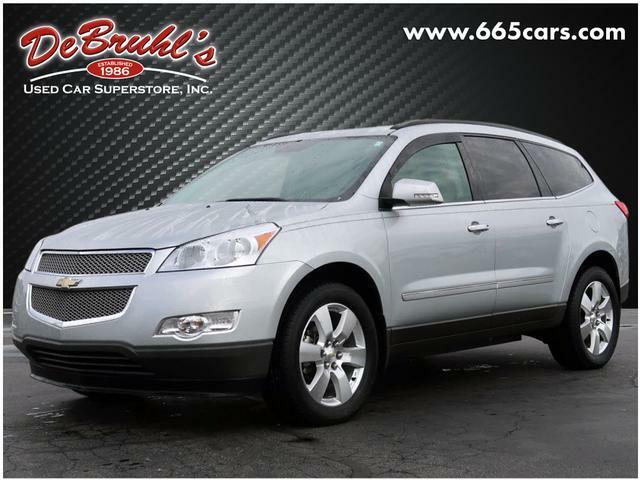 I would like to learn more about this 2012 Chevrolet Traverse LTZ. Please contact me as soon as possible! * TELESCOPING STEERING WHEEL * * 6 Cylinder engine * * GREAT DEAL AT $12,950 ** ONLY ONE PREVIOUS OWNER * * 2012 ** Chevrolet * * Traverse * * LTZ * Youll love getting behind the wheel of this 2012 Chevrolet Traverse LTZ, which is complete with amenities such as a rear air conditioning, parking assistance, a leather interior, dual climate control, heated seats, traction control, Bose sound system, AM/FM radio and CD player, anti-lock brakes, and dual airbags. It has a 6 Cylinder engine. Rocking a charming silver exterior and a light gray/ebony interior, this car is a great pick. This ones a keeper. It has a crash test safety rating of 5 out of 5 stars. Call today to test it out! DeBruhls Used Car Superstore is the largest independent auto dealer in WNC! We offer a full range of financing with our guarantee credit approval, everyone is approved here. Please email dealership for more info! VIEW 2012 Kia Soul !